Because your home is built on soil, and soil is susceptible to a wide variety of issues when it comes to moisture control, it’s important to explore all of those issues before tackling interior or exterior basement waterproofing. You may think an initial downpour is the most damaging when it comes to moisture in your basement, but soil retains moisture for weeks after rains, contributing to high humidity and the potential for mold. You need someone you can trust when it’s time to consider interior or exterior basement waterproofing. Interior and exterior basement waterproofing is often quite a challenge for repairmen and contractors. Why? Well, a lack of innovation for many companies means that the systems they install can often cause more leaks or raise the humidity even higher than before installation. You’d think that they’d work out a new approach, but many have not. 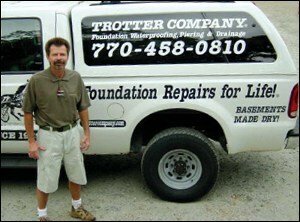 That’s not the case with Trotter Company. Instead of coping with market products that don’t deliver, and certainly don’t reflect our idea of service, we decided to change the way interior and exterior basement waterproofing is done by inventing our own state-of-the-art systems. Products like the VacuDry System and the Dry-Tec Crawlspace System mean your basement waterproofing–interior or exterior–meets our standards, stays dry, and prevents you from having to worry. As more and more companies come into the interior and exterior basement waterproofing industry, we see a lot of the same practices. Sure, franchises might have fancy commercials, but we’re willing to bet they don’t get 75% of their business from customer referrals. That’s right. We’ve built our business on the loyalty of our customers. And we extend that same service to you. Call us today to schedule a free estimate on your interior or exterior basement waterproofing project at (770) 458-0810, or fax us at (770) 458-0968.